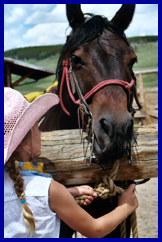 KidznFun :: Paradise Ranch in Buffalo, Wyoming offers families the dude ranch experience. A KidznFun review. A visit to Paradise Ranch is like going home. That's why families like the Krizman's keep going back year after year, celebrating a steady 15-year run. Debra Krizman recounts, "I picked out about five ranches I wanted to visit. Paradise Ranch was the first one. We've been here ever since. There's no reason to go anywhere else." Nine-year-old daughter Claire agrees, "We have to come back next year. It's what we do." Family tradition runs deep at Paradise Ranch. Upon check-in guests can see the list of attending guests for the week, including the number of years they've visited, kid's names and ages, and which cabin they're in. My daughter found this information useful. At the opening night orientation and cocktail party she hooked up with a similar aged girl. From there the two explored the ranch, got to know other kids, and were like sisters in a matter of days. Self contained, Paradise Ranch offers families a variety of activities, full family style dining, along with rustically elegant cabin accommodation. The focus is on riding, but hiking and fishing are also popular. The week starts out with a bit of riding, a picnic on the hill, children's activities and downtime to wind down into the Wyoming lifestyle. 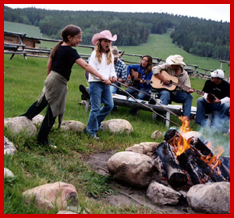 From there the activities are varied, with daily riding if desired, a kids' overnight, talent show, kid's dinners, gourmet feast for adults, Chuck wagon dinner, fishing clinics, kid's rodeo, and final night square dancing. It sounds like a lot, but families are happy to roll from one day to the next. No hoopla, no production, just good old-fashioned family events. The attitude at the ranch is kicked back. Information is provided on a need-to-know basis. Those accustomed to living by their Blackberry's will need some detox downtime to adjust. The ranch houses 175 horses in summer, from the gentlest mare to spirited stallion, there's a horse for every level of rider. Kirk Perry, ranch foreman, takes the job of matching horses to guests very seriously. 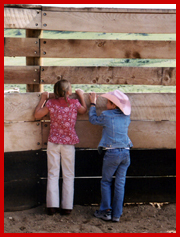 "As a family ranch we are very accommodating. But we will determine what's best for the guests. We choose a predictable horse for the kids. We err on the side of caution and protect the welfare of the horses." With 75 different trail rides to choose from, there's a ride for every level of rider. And the best part is that you can choose which general ride you want to go on. Choices include walking, walk-trot, walk-trot-lope, or loping. And loping means loping. Heading out for a mesa ride, our loping group stretched it out for a thigh burning, adrenaline pumping, adventure. On the other hand, the kids' group headed for the Aspens for a meandering walking ride through trees. Guests are assigned horses for the week. Removing the saddle and grooming the horse are daily chores. Perry elaborates, "It's not that we want to work the guest, it's just a big part of getting to know your horse. It's part of the experience." The experience worked for me. I loved brushing Strawberry. He'd give me the nod, a gentle nuzzle, and look for a treat. I was hooked. To shake it up a bit, the ranch offers team penning, barrel racing and pole bending. Getting those cows into the pen is no easy matter, but my team rose to the challenge, emerging triumphant. Strawberry wasn't a big fan of barrel racing, but we got the job done. My eight-year old sailed through the pole bending on steadfast Chili Bean. Must be that slalom racing practice on the slopes. A review of Paradise Ranch wouldn't be complete without mentioning the food. Served up family style, the ranch offered up a variety of food for any connoisseur. Served-to-order breakfasts, buffet lunches with salads, cold cuts, hot meals and more, plus a variety of dinner choices. The kids laughed over the choice of the grilled steak, "Do you want it kicking, mooing or dead?" Like magic, and without fanfare, my veggie meal arrived just as I finished my salad. It's about low-key service, the kind you would find at your favorite aunt's or best friend's house. Family style dining offers up the chance to meet and mingle with other families. Tentative at first, we nodded hello and went about our meal. By the end of the week the kids were eating at their own table, and the adults were laughing, sharing stories of riding, fishing, and hiking adventures. Families from New Jersey, Virginia, Illinois, New Hampshire and California got on like old friends. According to the Krizmans, it's a formula that works year after year. 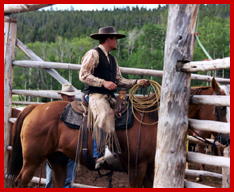 For non-riders the ranch offers fly-fishing, hiking, or just plain relaxing. They even combine an all day ride with fly-fishing for the ultimate adventure. On the last day at the ranch the wranglers rallied the kids for a rodeo. FUN doesn't get any better than this. A bit of chicken chasing, barrel racing, pole bending, boot racing, and antics by the rodeo clown got everyone howling. This week will live large in our family's hearts. More than the horses, or the fishing, or hiking, it's the lifestyle that sticks. The peaceful tranquility seeps into your bones. It wrings out the soul, rinses with crisp mountain air - and hangs it out to dry amid the rolling green hills dotted with wildflowers. The horses give one last neigh as we head out the gates. "Bye -bye Chili Bean!" shouts my daughter. I give Strawberry a salute. "Maybe we can come back next year." You can fly into Sheridan or Casper, Wyoming. The ranch provides a shuttle service at additional cost. Paradise Ranch gives you a packing list prior to arrival. If you want your kids to wear a helmet you should bring your own. This is the Wild West after all. Western boots are a must. Be sure they have a heel (to catch the stirrup) and are smooth bottomed (for ease of exit in an emergency). The cabins have washers and dryers (yea! ), so you can wear, wash, and wear those favorite jeans day after day. The cabins have daily maid service, but don't provide shampoo, lotion, etc. The cabins have kitchens so you can stock the refrigerator with soda, wine, beer, snacks, etc. The ranch provides a checklist-shopping list for you and will accommodate special requests. Or you can stop in at the store in Buffalo and pick up items for the frig (or get your driver to stop on the way from the airport). Pack layers, it can get cold. The "amateur" talent show showcases real talent. Pack props for a professional show. 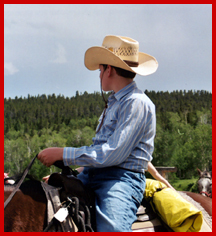 For more on Dude and Guest Ranches see our index. Read the article "Dudettes at Paradise" here. For more on Paradise Ranch see their website at ParadiseRanch.com.